Visitors at the Detroit Institute of Arts, which played a crucial role in the city’s bankruptcy plan. A federal judge approved Detroit’s bankruptcy plan today, allowing the city government to hit the reset button after its years of financial mismanagement. As part of the deal, which took a relatively speedy 16 months to complete, the city is eliminating $7 billion worth of debt—some creditors will be paid just 14 cents on the dollar—while slicing pension payments to its retired workforce by 4.5 percent (and ending their cost of living increases, and upping their health plan costs, and … you get the idea, it’s unpleasant). Meanwhile, the blueprint sets aside $1.7 billion over the next decade to cover critical needs, like demolishing abandoned homes and buying new fire trucks and ambulances. 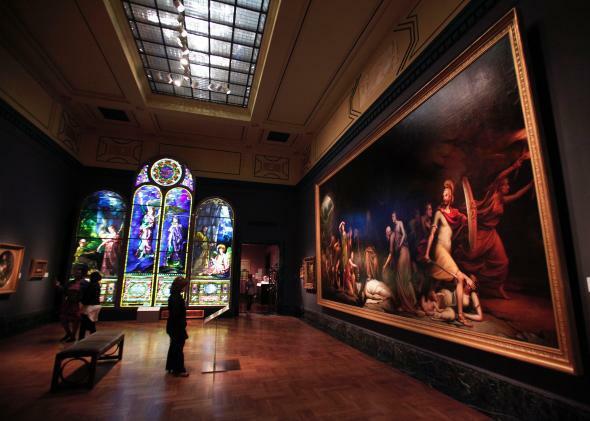 As many outlets are noting, the bankruptcy could have been far lengthier, and even more painful for retirees, had it not been for an unusual deal designed to save the Detroit Institute of Arts while minimizing cuts to pensions. The museum has been owned by the city since 1919, and its collection, appraised at $4.6 billion, includes works by the likes of Rembrandt, Van Gogh, and Matisse, as well as Bruegel the Elder’s masterful The Wedding Dance. In April 2013, the city’s governor-appointed emergency manager, Kevyn Orr, informed the DIA that it would have to contribute at least $500 million to paying off Detroit’s debts, even if meant selling off paintings at auction. Creditors also demanded a sale, because, you know, they’re creditors. Instead, the museum essentially went on an ambitious fundraising drive, in which it managed to raise more than $800 million, including $330 million from nine different philanthropic foundations. Another $200 million came from the state of Michigan, which, despite Gov. Rick Snyder’s protestations that he wouldn’t bail out Detroit, did apparently feel compelled to preserve some of its cultural heritage. In return for the money, the deal will essentially “ransom the museum from city ownership,” as the New York Times puts it, placing it in control of an independent charitable trust. So Detroit gets to keep its art collection. Pensioners get to keep a little more of their income. And the museum never has to worry about municipal finances ever again. A nice bargain all around.